ANAHEIM, Calif. — Big decisions loom for Rui Hachimura and Brandon Clarke now that the 2018-19 season is over, but the junior forwards were still officially Gonzaga basketball players when they left the Bulldogs’ locker room Saturday after a 75-69 loss to Texas Tech. Gonzaga’s frontcourt boasted not one, but two players who are widely projected to go in the first round of the upcoming NBA draft — and who many think will forfeit their final year of eligibility because of the seven-figure paychecks that could be coming their way soon. 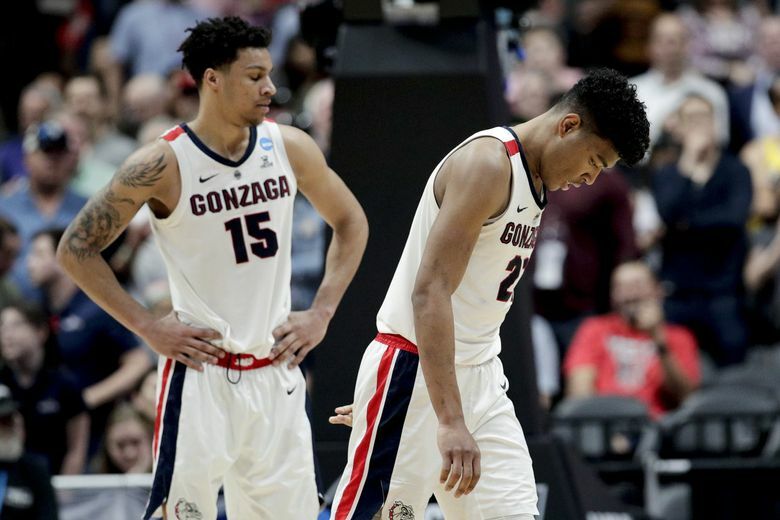 But neither Hachimura or Clarke had come to that conclusion as of Saturday night, both declining to make decisions about their future in the raw moments after GU’s Elite Eight loss. In the coming weeks — or days — Clarke will visit the NBA conversation with his family, friends and coaches. A recent Yahoo! Sports mock draft projects the junior to be selected seventh by the Atlanta Hawks. He finished the year averaging 16.9 points, 8.5 rebounds and 3.1 blocks. The same Yahoo! Sports mock draft expects Hachimura to fall 14 spots below his GU teammate, but still in the first round, to the Utah Jazz. The junior from Toyama, Japan, will use the same timeline to decision-making process to determine his own future. Norvell Jr. averaged more than 15 points, four rebounds and three assists for the Bulldogs, starting in every game but Senior Day. Tillie’s season was shortened by injury and the 6-10 forward from France played in only 14 games, averaging 6.4 points and 4.1 rebounds.